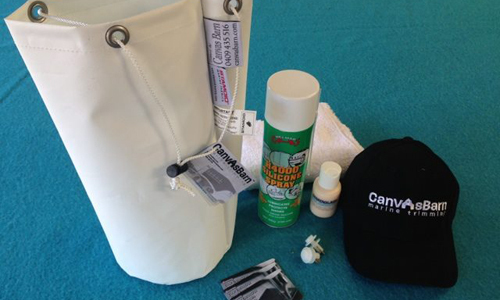 This bag of goodies has what you need to care for your boat cover. The Canvas Barn Marine Trimming Workshop is strictly open by appointment only. Please contact us for an appointment. Hours 8:30am to 4.30pm Mon-Friday. Fridays are dedicated to boat visits and quoting. Acid trouble – protect your clears! Over the last few months, we have been asked to look at a large number of clear enclosures that have aged prematurely and need replacing due to acid damage. A few of these are made of extruded roll glass, but most of them are made from pressed polished sheets. Both of these products represent a significant monetary investment by the vessel owner, in some cases well over $10000. When we look at the enclosures, it has become apparent that the product needs replacing purely because it has been exposed to an incompatible product, generally an acid. which clear do you want? The acid damage on the left? Or the clear on the right? The acid damage can arise from a couple of different sources. Anti-fouling treatment. 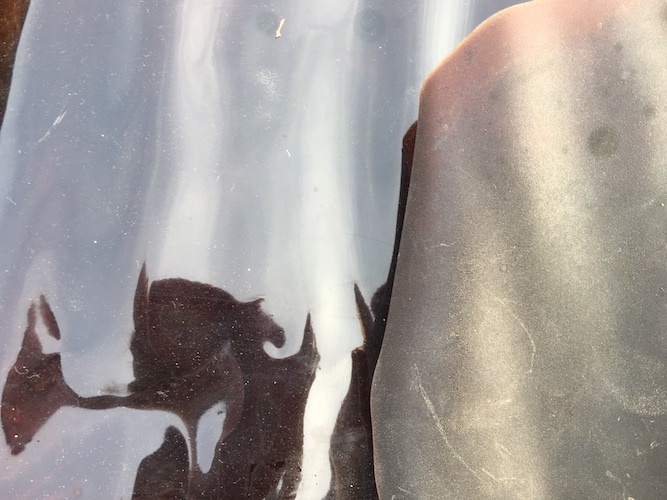 When properly done, antifouling treatment involves water-blasting the hull to drive off barnacles, followed up with a wet rub and acid washing the hull to remove scum and any other foreign contaminate build up on the gel coat. Of course, that acid washing is then sprayed off, sending a fine mist of acidic droplets into the air which then settles on your clears. Most boats receive an antifoul treatment every 12-24 months. Gel-coat restoration. 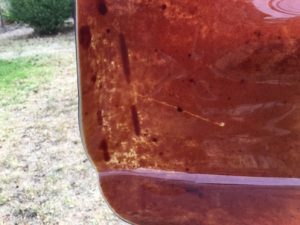 Most Gel Coat Restorers are acid-based washes that will clean and revive your hull by removing oxidation, and will de-yellow your fibreglass or 2-pack painted hull. It also will also remove any rust marks from your hull. Again, the acidified droplets form a mist and float down onto your clears. It is easy to see the results of acid exposure on clears. If ageing occurs naturally, the clears become yellower and brittle along the lower edges, and this is more pronounced on the panels receiving higher levels of sunlight and UV exposure. So those panels to the north, east, and west, will age faster than those to the south. Boats on a swing mooring receive more even levels of UV exposure and the panels age quite evenly. But panels that receive overspray or drift often display distinct bands in the clear showing exactly where the drift has come from. It might have been from the owner washing the front deck, the boat next door when on the hard-stand, or even from further away. 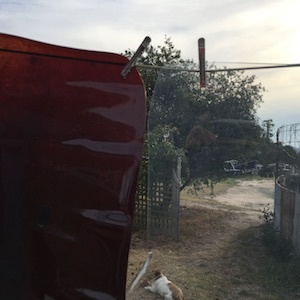 Sometimes the spots show as white dots, sometimes as rusty red patches and the worst case we have seen is complete coverage with dark reddish brown etching over the whole clear panel. In this case, the owner pressure washed his enclosure with truck wash and left it overnight. In most cases, the outside of the panel will feel rough, etched and pitted, while the inside will still be supple and smooth. Acid damage on clear panel. remove and store your clears BEFORE sending your boat to the shipwright for any work, or to the hard stand for any work, particularly antifouling. Be aware of other vessels where work is being performed. Replace them as soon as possible the boat has been treated. Protect your clears by keeping them covered when you are not using your boat. This might be impractical on a flybridge cruiser, but entirely possible for a sports cruiser or yacht. This extends the life of the clears enormously, for years, in fact, and let’s face it, clears are the most expensive component in your covers. Protect your clears by using the correct cleaning products on them, and clean them as per the manufacturer’s instructions. The manufacturers of STRATAGLASS only recommend using IMAR products to clean and polish their clears. A layer of polish acts just like a polish on a car, or on furniture, protecting the clear from many nasties in the environment. IMAR also make acid free products to clean and restore gel coat. IMAR products can be used on roll glass, but NOT on Polycarbonate. Educate yourself, your detailer, and those who have boats around you, on the products you are using, and choose ph neutral products to use on your boat. Read the label. Cheap isn’t always best. The “boat cleaner” from the franchise store may not be the best product to use, even if it is a quarter of the price. Will your insurance policy cover the damage? Who knows. We know of some individuals who have lodged successful claims, while others have been knocked back. Your best insurance is knowledge. If there’s anything else you’d like to know, or if you are looking for some IMAR products, send an email to info@canvasbarn.com and we will be in touch with the info you need. We’ve done it a couple of times, and it’s always fun to spend a couple of days in the boat. The Gippsland Lakes complex covers over 400 square kilometres. Think about that! That’s a lot of water! Seven major rivers flow into the lakes, The Tambo, Nicholson and Mitchell in the east, the Avon, Latrobe, Macalister and the Thomson in the west. Most of these rivers have their headwaters in the high country to the north. The main lakes themselves are known as Lake King, Lake Victoria and Lake Wellington. Just over the sand dunes, is Bass Straight and the Ninety Mile Beach. Lake Reeve is a shallow body of water. Lake Tyers, and Lake Bunga to the east are not classed as part of the lakes system. Want an Exciting and FUN Industry Event? Spectex15 is done and dusted. Specialising in on water boats and timber boats. Canvas Barn Marine Trimming has the cover for you! © Copyright 2014-2019. Canvas Barn Marine Trimming. Website by Something Simple Will Do. Hosted on SiteGround.